Below-knee amputation is usually performed for extensive high-grade soft-tissue sarcomas of the lower leg, ankle or foot. Primary bone sarcomas rarely occur in these locations. Extensive infiltration of tendons and ligaments and around bones in this area may preclude a functional extremity following wide excision. The almost universally good functional outcome of below-knee amputation makes it an even more realisticoption. 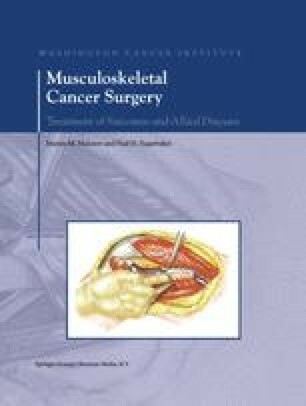 General considerations that were discussed for above-knee amputation also apply for below-knee amputation; design of skin flaps is determined by the anatomic extent of the individual tumor and the large majority of these patients heal uneventfully. Emphasis is on flap design and meticulous dissection, use of continuous epineural analgesia, myodesis of the major muscle groups of the distal tibia, meticulous wound closure, and application of a rigid dressing.